Pharox Announces Affordable LED Bulbs That Cost Just $4.95! Energy efficient LED light bulbs just got a lot more accessible and affordable with Lemnis’ Pharox LED bulbs! The lighting company has just release three new Pharox LED bulbs, one of which comes with the alluring pricetag of $4.95! The 200-Lumen Pharox BLU has an estimated lifespan of 10 years, paying for itself in no time! Available online through the Pharox website, the new bulbs were designed to encourage first time LED users to try out the benefits of the long lasting bulbs. Feeling that many consumers were intimidated by the average $20-$50 price tag for LED efficient bulbs, Pharox created the affordable 200 and 300 BLU as an introductory bulb. The U.S. Department of Energy has said they expect energy efficient LEDs to replace 76% of lighting needs by 2030, but with this new lower cost option, that date could be even earlier. The Pharox BLU bulbs pay for themselves in as little as 6 months, so they predict consumers will be ecstatic about the savings to be had over the 10 year lifespan of the bulbs. But the new affordable line are no frills — they cannot be used in dimmers and only come two models. But they do cast the warm white light of soft white traditional incandescent bulbs. 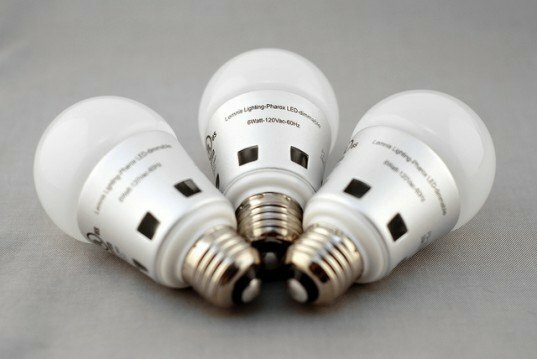 The bulbs also generate virtually no heat, unlike traditional bulbs that get hot and add unwanted heat to your living space in summer time. Good for 15,000-35,000 hours of usage, the bulbs are even recyclable once they’ve been exhausted. The One-Week Pharox 200 BLU Report The 240 lumens each that the 200 BLU produce is best reserved for a space where lower light is acceptable. Or, where you will have lotsa bulbs operating. Overall, I am happy with the 200 BLU and how cool they run. You can touch them after a day of being on without risk of burning your fingers off. The heat sink does get warm, but not dangerously hot. I will definitely be upgrading my kitchen to the higher lumen models and move the 200 BLUs to my bathroom, where blinding light first thing in the morning is never welcome. My five 200 BLU have arrived. In my kitchen, there is a 5-bulb chandelier that now houses these bulbs. The total lumen output is obviously less than the 60-watters in there (840 vs 240), but I just cut the total wattage from 300 to 25. The kitchen is lit well enough with the 1200 lumens now present. I am going to place another order and upgrade my bathroom. The electric bill reduction begin! Mine order of five Pharox 200 Blu bulbs will be in my mailbox today. Their planned installed is for my kitchen, where my kitchen lighting is a ceiling-hanging thing with 5 bulbs in it. Since there are five bulbs, the reduction in overall light should be minimal compared to the 60-watters I am running in the winter time. I will report back with actual results. @inhyak, you were looking at the Pharox 300 Blue which emits 360 lumens at 6 watts. The Pharox 200 Blu is $4.95 @mavsguy842, The Pharox 200 Blu, the specs are as follows: Shape equivalent: A, A19 Fitting: E26 Wattage: 5 watt Voltage: 110 volt Line frequency: 50-60 hz Average lifetime: 15,000 hrs Color temperature: 2700 K Luminous flux / Light output: 240 lumen Color Rendering Index: 85 Typical efficacy: 42 lm/W Net weight per piece: 0.135 kg / 0.30 lbs Diameter: 58 mm / 2.28 inches Height: 105 mm / 4.13 inches Dimmable: No And @caeman, I completely agree. This is a great step towards innovative illumination! Great design and technology is always about refining what works well and making it better! I love it! Now there are no excuses for people to continue using those toxic CFLs. I bet when one of these LED bulbs break, there is no 6-page hazardous cleanup routine to follow. How many watts do they use? Which is the $4.95 bulb? I found $6.95; still a great price. Energy efficient LED light bulbs just got a lot more accessible and affordable with Lemnis' Pharox LED bulbs! The lighting company has just release three new Pharox LED bulbs, one of which comes with the alluring pricetag of $4.95! The 200-Lumen Pharox BLU has an estimated lifespan of 10 years, paying for itself in no time!